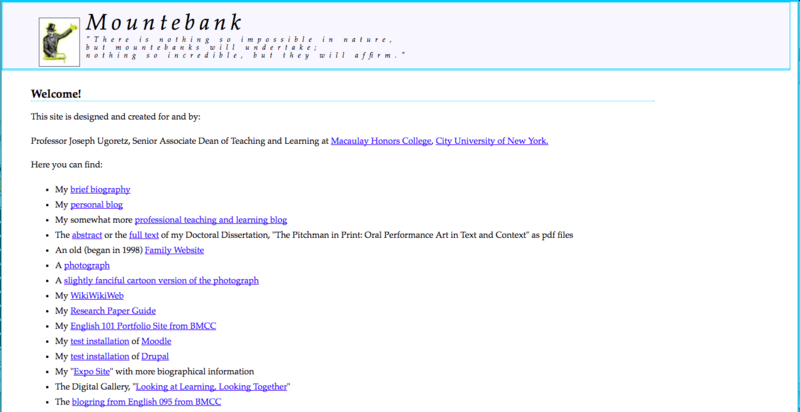 For a very long time (since March 2004) my homepage here at mountebank.org has had the same look. It was clear, and readable, I always thought, and really just a list of links. But it certainly didn’t look too modern. Didn’t really represent very well what I’ve been doing with WordPress lately. The blog was using the first WordPress theme I ever built, and simple as it was, it worked. So, with some time off and a cold day (really a couple of days), I took the chance to do some redesigning. The homepage is now more like a “calling card” with far less on it (although I think I will put a bit more as time goes by). And the blog is still the same old blog (it was fun to look through some old content). I still won’t update it very frequently, probably, but from time to time I’m glad to have it as a medium. And I learned a lot as always in the redesign (also moved to a new host and cloud server). My CSS skills are improving. And my MySQL skills less so. My overall command line comfort is unjustifiably secure. And in WordPress…I pretty much know what I’m doing.